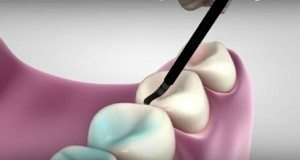 Dental Sealants – What Are They and Are They Safe? Posted January 16, 2017 by admin & filed under Family Dental Care, General Dentistry, Modern Technology. According to the Centers for Disease Control and Prevention (CDC), dental cavities or tooth decay is the number one chronic disease in children between the ages of six to eleven (25%) and adolescents aged 12 to 19 years (59%). Tooth decay is four times more common than asthma among adolescents 14 to 17 (15%). A staggering 51 Million+ school hours are missed each year by school-age children due to dental problems. Children in dental pain are distracted from their studies. But children who have healthy teeth have better attendance and are more attentive in school. The good news is that tooth decay is one of the most preventable diseases. Brushing and flossing are the best ways to prevent tooth decay. But many times bacteria and food particles can remain on the back teeth or molars, which are often rough and have deep grooves or fissures. One of the best ways to help prevent tooth decay is for a dentist to apply a dental sealant on chewing surface of the molar. • Sealants on permanent molars reduce the risk of cavities by 80%. • Dental sealants are safe and approved for both children and adults. • Sealants can be applied to the first molars, generally children start getting those at six years old. Their second molars usually pop through the gums at 12 years old. • Adults can also benefit from sealants. • Sealants generally last for several years and a dentist can reapply them, as necessary.